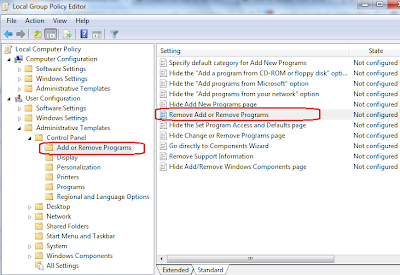 Add or Remove Programs feature allows users to uninstall, install or repair software products installed on their Windows computers. If you do not want others to access this feature on your PC, you can restrict access to this window by disabling this feature on your computer. There are two methods to disable Add or Remove Programs on your computer. Either from Group Policy Editor or from Windows Registry. Both methods are explained below. At the end of the guide, you can see how to lift restrictions to enter this feature. In most cases, this restriction is due to recent malware infection. You can use the same procedure in case if you are facing troubles to enter this window on your laptop. Now onwards any user tries to access this window will receive the error message "Add or Remove Programs has been restricted. Please check with your administrator". You cannot use this method to disable this function on Windows 8, Windows 7 and Vista computers. This method supports only Windows XP, Windows 2000 and Server 2003 only. If you are having the latest versions of Operating systems from Vista onwards, you may try the next method. We can disable Add/Remove Programs from Registry Editor too. Steps are provided below. In case if you want to enable access to this feature on your computer, follow the steps below. If you are receiving the error message "Add or Remove Programs has been restricted. Please check with your administrator" while trying to access this feature, follow the steps below. So if you are seeing issues with opening this feature on your computer, you may try the steps explained just above this paragraph. We cannot predict the malware products used which method to disable this feature. so I recommend you to ensure that the access to this tool enables from both Group Policy and Windows Registry. Why My Computer Restarts Automatically?